Last night’s Culture Show on BBC2, “The Art of Boxing”, was a classic. Introduced by author Tony Parsons, it featured a potted history of boxing and its association with the arts in the 20th century. It also presented a pretty good case for boxing being accepted as an art in itself. A lineup of famous boxing fans was reeled out: Hemingway, Miro, T S Elliot, Picasso, Manet, The Beatles and Joyce Carol Oates… to name but a few. And not only did they watch, but plenty of them actually boxed as well. Tony Parsons boxes too. Has done for the last ten years, as we got to witness last night on BBC2, as he went through his paces and seemed to be giving as good as he got. And he’s not the only one. Boxing here in the UK, after finding itself unfashionably violent in the 60s and 70s, is enjoying a comeback. Which means it’s only a matter of time, of course, before we see this reflected once more in the arts. The first film ever made was of a boxing match in 1897. Boxing is what secured the switchover for the American public from the movies to the small screen (like snooker, it’s a perfect fit). Countless movies, songs, photos and paintings revolve around it. 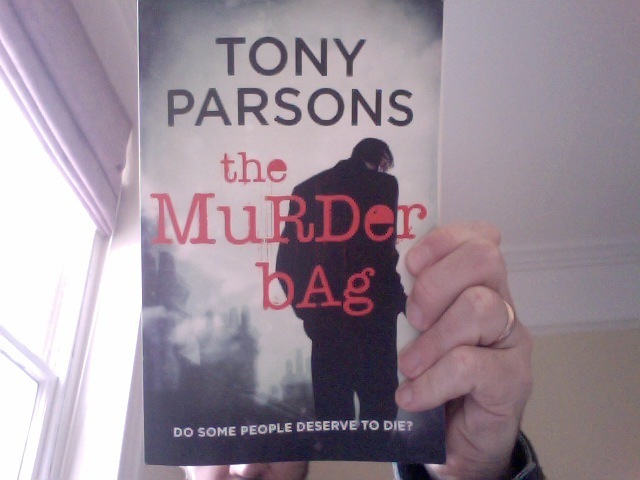 And now Tony Parsons’ new literary departure does too. The Murder Bag is his first crime novel, after his phenomenally successful fiction series on post-war masculinity, which began with Man and Boy. And starring in The Murder Bag is Detective Max Wolfe of the Homicide and Serious Crime Command. Single parent. Insomniac. Dog lover. Coffee addict. Orphan. Devoted husband of a brutally departed wife, defender of the weak and every murderer’s worst nightmare. Oh, and you guessed it, he’s a boxer too. Here’s a picture of me holding an advance copy in my far from Henry Cooper-sized left fist. It looks good. Maybe even knock out. I’m looking forward to reading it and will report back once I’ve made it through to the bell. For those of you lucky enough to be able to be in the vicinity of Brighton on May bank holiday weekend,Tony Parsons will also be appearing as part of the Dark & Stormy crime festival. Tickets available here. This entry was posted in Uncategorized and tagged Dark & Stormy, Emlyn Rees, The Murder Bag, Tony Parsons. Bookmark the permalink. Good to be in touch.